Your body, as a whole, is one organism. However, many, many parts make up that whole. As you consider the various levels of the body (see Figure 1), you understand that a large number of parts are within parts. It’s akin to looking at a pine tree. At first, you notice the entire tree — a whole organism. However, as you look closer, you notice the branches. Looking at the twigs on the branches, you notice each needle on the twigs. Thousands, if not millions, of needles exist on that one single pine tree. The same analogy holds for the human body or the body of any animal. First, you notice the entire body. Next, you see that the entire body is made up of parts and organs, and each of those organs is made up of a variety of tissues. And if, as a pathologist does, you examine a magnified sample of one of the human body’s tissues under a microscope, millions of cells become visible. Yet you can turn up the magnification for an even closer look: Cells contain molecules that are made up of even smaller components called atoms. 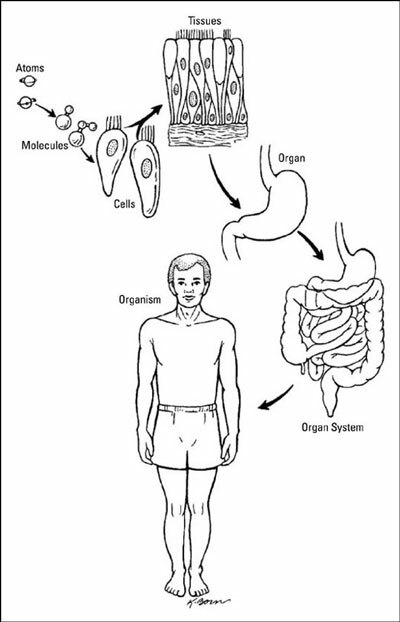 Figure 1: Levels of the body from smallest to largest: Atoms, molecules, cells, tissues, organs, and organ systems. Atoms, molecules, cells, tissues, organs, and organ systems are the body’s building blocks. Getting to know these most basic parts to see how their functions affect the rest of the parts of the body is a good idea. An atom is the smallest possible piece of an element that retains all the properties of that element. For example, a hydrogen atom reacts the same as a barrel full of hydrogen. Each atom is a building block. If you put two atoms of hydrogen (H) together, you get a molecule (H2). If you add that molecule of hydrogen to an atom of oxygen (O), you create a molecule of water. A molecule is a conglomerate of atoms. Got that? Your body contains many different types of molecules that form the working parts, such as cells, as well as substances produced by some of those parts, such as hormones. Your cells perform many important functions without which you wouldn’t be able to go about your business. While you breathe, your cells exchange the bad air for the good air. While you eat, cells produce the enzymes (proteins that speed up a chemical reaction) that digest the food and convert the nutrients into a useable form of energy. In short, your cells are like tiny motors that keep you running. No smaller component than the cell performs all those important functions. That’s why the cell is the “fundamental unit of life.” Every living thing has cells, and those cells perform basically the same functions whether they’re in a human, a horse, or a hyacinth. The body contains several different types of cells, such as blood cells, nerve cells, and muscle cells. When cells of the same type “hang together” so to speak, and perform the same function, a tissue is formed. When you think of tissue, you probably think of skin, if not the box of facial tissues that you grab whenever you sneeze. In fact, the body contains four classes of tissues. Connective tissue, whichis found in blood and bones, serves to support body parts and bind them together. Epithelial tissue (epithelium) is the type of tissue that lines organs and covers the body. Muscle tissue — surprise! — is found in the muscles, which allow your body parts to move via the acts of contraction and relaxation. Nerve tissue transmits impulses and forms nerves. Atoms make up molecules; molecules make up cells; cells make up tissues; and two or more kinds of tissues working together make an organ. An organ is a part of the body that performs a specialized physiologic function. For example, the stomach contains epithelial tissue, muscle tissue, nerve tissue, and connective tissue, and the stomach has the specific physiologic function of breaking down food. An organ system is a group of specialized organs working together to achieve a major physiological need. For example, the mouth, esophagus, stomach, small intestine, and large intestine are all organs of the digestive system. The digestive system is the organ system responsible for breaking down foods into nutrients that can be transported through the bloodstream.